I had ordered my 27″ i7 iMac on Black Friday and expected for it to arrive on Dec 22nd as per the information on the Apple Store website. I was happily surprised to suddenly have a UPS lady at my doorstep at 5 pm. I had never gotten a package from any package delivery service that late, that was another first. When I inquired about that, she responded: “We start at 5 am and we don’t stop until all packages are delivered”. I like that kind of service. My brother-in-law helped me record the unboxing on my iPhone 3GS. To get it from 15 minutes down to the maximum allowed 10 minutes for YouTube I already used iMovie on the new machine. 27″ gorgeous LED-lit wide display. It’s also huge. Almost twice as wide as my 15″ MacBook Pro display. 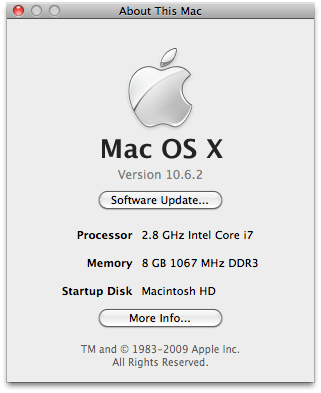 i7 CPU, the fastest iMAC machine. It’s also the greenest because between high-power compiling it can idle more thus using less energy. As a final test of happiness I installed XCode on it and timed a complete build (after clean all) of MyAppSales. I had to first export my certificates including private keys from my MacBook and import them on the iMac’s keychain. Then I also copied the provisioning profiles and installed all things via double click. I had to double-check these results, but really the i7 compiles my biggest project 3 times as fast. You wouldn’t think that having the processor speed rated at the same value. But more cores and 2 generations later give you such a turbo-boost. “Roarr!” says the Tiger, pardon, Leopard, pardon SNOW Leopard. ← Dr. Touch #008 – "Christmas in Sight"